Has anyone read this book? It's quite interesting. "When Victims Rule - A Critique of Jewish Pre-Eminence in America"
Chapter 18 is in 2 parts, titled "The Holocaust and Genocide"
Although the book does not explicitly deny the Holocaust, it has many revealing quotes by Jews about the nature of how it is viewed in Jewish culture. It even notes that many Jewish survivors were despised by other Jews in Israel. In fact, the book, despite being critical of Jewish supremacism and influence in the west, relies almost exclusively on Jewish sources. Really, the book just brings up allegations of Nazi extermination for the purpose of quoting jews who are critical of the double-standards of their fellow tribesmen, basically just pointing out "hey guys, it wasn't just us that were persecuted and sent to camps"
It also gives brief overview of how the "Holocaust" was treated as an event by Jews over time, and the events which caused a resurgence of the "Holocaust" as a part of Jewish identity. so sacrosanct and undiscussed that they start to smell fishy." in the hope of not being held responsible for their bigotry. is doing because he is a Jew." information about it for many of its viewers." emotionally rather than historically to that great tragedy." sufferings of others, becoming two sides of the same coin." culture at large. What accounts for this unusual chronology?" political function in the hands of some Jews." "What I hated and dreaded most when I was a child was summertime. concentration camp, air nationally over ABC TV on May 20 and May 21.
describing her parents' difficult marriage, was released in March. in Los Angeles last month. the 'secret annex' where the Frank family hid. 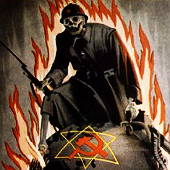 The old Jewish self-identity of weakness and victimization -- based on the Jewish martyrological tradition of death, destruction, and terror -- became now a conviction of armor, militantly wielded, shaped with the very shame and horror of the Holocaust. The resultant Israeli victory over the Arabs meant a symbolic return to physical power, along biblical lines even, for many Jews, redemption. It also meant the springboard for a new Holocaust-centeredness, aggressive in its character, hostile and embittered to non-Jews everywhere around them. And it was adept in milking communal guilt from comfortable Jews in America who experienced nothing of the risks of 1967 Israel nor the European Holocaust years. A victorious Israel rising up out of ashes of the Holocaust became the cornerstone of Jewish self-conception. The Holocaust was no longer shamefully harmful to the Jewish self-image. It was now a much-heralded building block for the state of Israel and impassioned Jewish vigor, everywhere discussed, everywhere publicized.